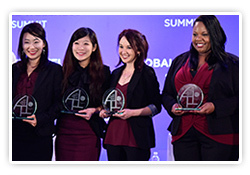 The Global Wellness Summit, with the help of the famous Ecole hôtelière de Lausanne, launched the first Student Challenge at the third annual Summit that took place in Interlaken, Switzerland, in 2009. Due to its popularity, it quickly became a staple component of each subsequent year’s agenda. 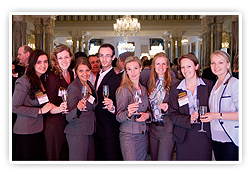 The Student Challenge is a competition for students in fields of study relevant to the spa and wellness industry. While the logistics of the Student Challenge vary slightly from year to year, the focus is always on developing or designing a spa of the future. Each team of three students will work in conjunction with a professor (faculty advisor) from their school and a professional architect or designer chosen by the Global Wellness Summit. Objective: To design a spa resort/wellness concept that is profitable, practical and innovative. It must encompass Latin American Culture and be able to be rolled out globally and must be commercially viable, credible and proven. 1st Place: The University of Nevada Las Vegas with its concept of Ch’ulel Mendoza, a vinotherapy-inspired resort spa (Team members: Gina Marano, I-JuLu, Courtney Marshall and Eun Joo Kim). 2nd Place: Universidad Anáhuac México Norte. Prizes: US$2,000 and a trophy for first place, and US$1.000 for second place. Objective: To design a spa resort/wellness concept that is profitable, practical and innovative. It must encompass North African Culture and be able to be rolled out globally and must be commercially viable, credible and proven. 1st Place: Mohammed V University’s Samrae Spa & Salon. 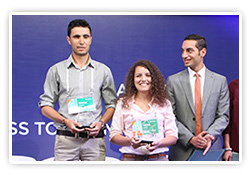 (Team members: Hassan Errifai, Aicha Zaimi, Rabiaa Farres and Ayoub Zaimi). 2nd Place: The American University in Cairo. 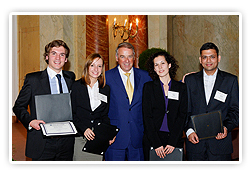 3rd Place (tied): Al Akhawayn University and ESSEC Business School. Prizes: US$1,000 and a trophy for first place, US$500 for second place, and US$250 for third place. 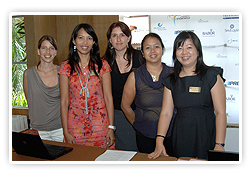 Objective: To design a spa of the future that is profitable with a GSWS-assigned architect. 1st Place: Institute of Hotel Management, Aurangabad (IHM-A)’s Spasthya brand,where spas are designed to help people integrate socially, by teaching health, hygiene and practical wellness like healthy cookbooks/cooking classes for the common man (Team members: Shreeya Mahant, Varun Sahgal, Raj Shah). 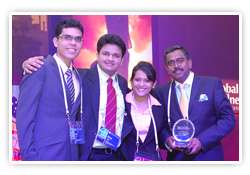 2nd Place (tied): Indian School of Business, Hyderabad’s The Saartha and University of Delhi, New Delhi’s Sparsh. 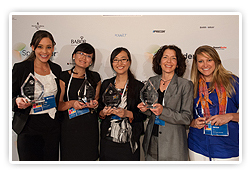 Prizes: US$1,000 and a trophy for first place, and US$750 for second place. 1st Place: University of Denver’s “Defiant!” spa, a spa that rejects the typical “pampering-patronizing-pink-and-sparkly-manicure” teen spa model to tackle the emotional, physical and social needs of real girls (Team members: Lian Duan, Molly Tompkins, Jing Wan). 2nd Place: Cornell University’s “mente spa & studio” concept. 3rd Place (tied): Pennsylvania State University and University of Houston. Prizes: US$1,000 and a trophy for first place, US$500 for second place, and US$250 for third place. 1st Place: Hong Kong Polytechnic University’s “Yi Spa,” a franchised, fixed-locale day spa and a mobile spa van that travels (team members: Tommy Gu, Kitsun Lau, Joyce Ng and Carol Zhang). 3rd Place (tied): Gadjah Mada University (Indonesia) and Cornell Nanyang Institute of Hospitality Management (Singapore). Prizes: US$1,000 and a trophy for first place, US$500 for second place, and US$250 for third place. Objective: To design a spa of the future that is innovative, environmentally and culturally aware in the historic thermal springs of Kulu, Turkey. 1st Place: Samuel Pitnick, University of Southern California, developed an in-town cultural spa and bathing center and a luxury destination spa situated on an extinct volcano. 2nd Place: Nazim Kahraman, Istanbul Technical University, imagined a 20-room spa hotel/healing center focused on the free play between the inside and outside settings. 3rd Place: Natalie Shull, University of Southern California, designed an agri-tourism spa and culinary school situated on a dramatic plateau between Kulu and the geothermal park. Prizes: US$1,000 and a trophy for first place, US$500 for second place, and US$250 for third place. Objective: To design a spa of the future for the 21- to 30-year-old demographic. Runner Up: Ecole hôtelière de Lausanne’s college campus-integrated spa, “Spa4U.” Prize: Each member of the winning team from IMHI received a certificate for free registration to a future Summit (valued at US$2,290 per student).